Twilight Cake for Kaitlyn's 13th Birthday Party! My daughter turned 13 this year, and Twilight was the perfect theme. Of course you can not find any kind of decorations. So we went with the last part of the book where Edward and Bella went to prom and danced under the stars and the twinkling lights in the gazboo. We waited till dusk, and ran clear lights all around the gazboo and the yard. We also had a stand-up of Edward, then I put a large piece of white fabic behind a archway leading away from the gazboo, where the girls could have pictures taken with him. The archway was also lit up and had red roses and white roses entwined throughout the archway.We played the twilight sound track through the whole party, they kids and also the adults loved it. I had two long tables in my garage set up with black and red table cloths and twinkling lights. I also put floating candles in glass heart containers with red and white crystal gems in the bottom of the water. I also had apples around everywhere. I went and had a picture of Edward scanned on her birthday cake, candy apples, candy popcorn, red and black m&ms. We had rasberry punch, and i didnt make mushroom ravioli, I bought pizza. We bobbed for apples, played Twilight Jeoperdy, and the Werewolf Howling game for the boys. All the girls got a gift bag, with red finger nail polish, body shimmer, copy of the Twilight sound track, stuffed lion and a lamb,and we made bookmarks with different quotes from the book also. It turned out very nice and my daughter was very surprised because it was a surprise party. For prizes I bought Twilight poster and the Breaking Dawn book. It was a party that my daughter, her friends and I will remember forever. My 15th birthday is about a month away and I really want to have a Twilight themed party because I'm obsessed! That is so cool. I am turning 13 tis year and woould like to have a Twilight birthday party. You have a great imagination and I love your ideas. Your Twilight party ideas are really good, and I am sure Kaitlyn and her friends had a great time! 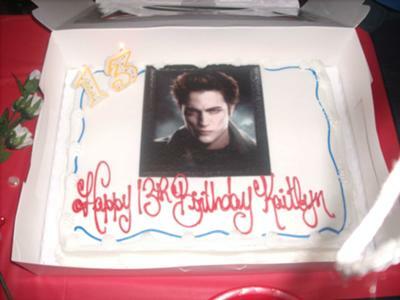 The birthday cake looks great, you used a nice picture of Edward Cullen. You planned a very nice party for your daughter. I think Alice would approve of your party decorations...you used twinkle lights and they are her favorite. I like the Edward Cullen Stand Up so the kids could get some pictures! The party favors and game prizes you used were Great~I am glad you used the Jeopardy game and the Werewolf Yelling Contest is really funny, isn't it? Thanks for sharing your story and your picture with us...and Happy 13th Birthday Kaitlyn!